This download is a replacement of Visual Micro for Visual Studio 2012, 2013 and 2015 If you have previously installed visual micro into vs2012, 2013,2015 then you will notice the previous extension in the list under tools>extensions and updated>installed. The older extension can be removed without causing loss of configuration. Pricing is 'Personal Use' from $45 for up to 3 machines and 'Commercial/Business Use' from $65 for one machine. Free for non-commercial use by students. A rich Arduino compatible development environment. Tested with all Arduino versions from 1.0 to 1.8.x (+ 1.9 beta testing) (also supports all compatible hardware such as ESP8266, Energia IDE). The extension should be purchased after evaluating for up to 90 days. It will continue to function after the evaluation but should be purchased. This Extension requires Visual Studio C++ to be installed before Arduino projects can be created or opened. The Visual Micro extension also provides a unique software (serial, software serial, xbee, rf etc) debugger for boards such as the Arduino Uno and Mega. Locating libraries in any folder and sharing different library versions between one or more projects is also supported. NOTE: THIS IS THE LAST RELEASE FOR VS2012 AND VS2013. We want to integrate GDB debugging more tightly into Visual Micro which is prevented by compatibility with 2012 and 2013. Furthermore Microsoft have introduced a new Visual Studio Package system for extensions which is incompatible with 2012 and 2013. Too many updates? Visual Micro is updated frequently. If the frequency of the updates annoy you then please switch off Automatic Update via "Tools>Extensions and Updates". With "auto updates" switched off, Visual Micro will, more politely notify you every few months when a major release is available. 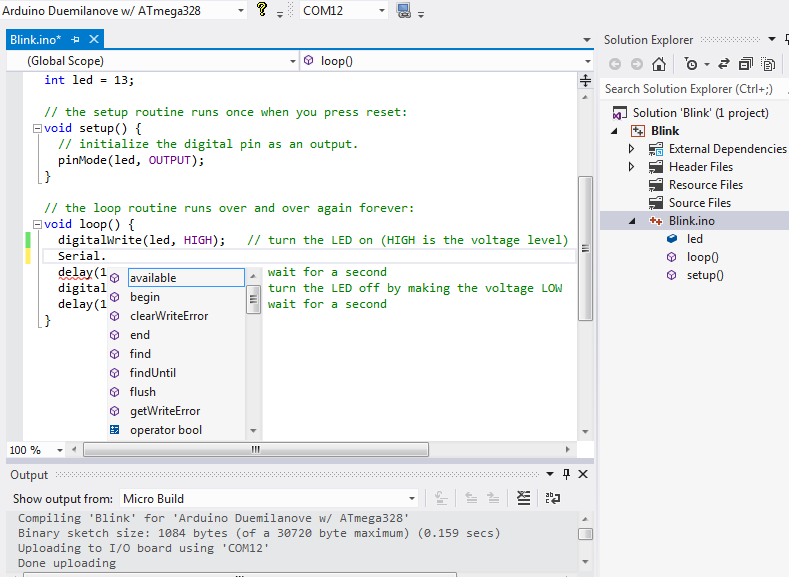 Visual Micro ensures program code remains fully compatible with the Arduino Ide and supports all Arduino versions. Visual Micro shares the same configuration as the Arduino Ide. Due to positive changes by Microsoft in Visual Studio, this extension is for older versions of Visual Studio, 2012, 2013 and 2015. Over the next 12-24 months support will be phased out so please please upgrade to VS2017 or VS2019 and the latest Visual Micro.